Warblers are among the highest prized things with wings for the avid birder. And they call them wood-warblers for a reason. I’ll be heading into my 3rd migration season as a birder with a bit of a heavy heart as I’ve recently become aware of the full extent of the clearcutting that is happening in Nova Scotia. As well that a 13-mill consortium called Westfor has their eye on the Western Crown Lands which have been described as “the last great wood basket” not committed to pulp companies, which will effectively destroy the last of our forests here in the province. To enjoy spring migration to the fullest, brushing up is always recommended. So, partially to encourage some discussion about the preservation of mixed, multi-aged forest in Nova Scotia, and partly as a little research project for myself to prepare I spent much of today studying the breeding habitat of Nova Scotia wood-warblers. Of the 40 Wood Warblers that have been recorded in Nova Scotia, 22 of them breed here both currently and historically. Two have been added to the list recently but one (Yellow-breasted Chat) was certainly incidental and the other (Pine Warbler) could be the beginning of an expansion of breeding territory to come in future years. My lifelong love of walking in the woods, and back-country canoe camping in recent years, have proven to be a great foundation for studying our wood-warblers first hand. While writing this today I realized that I’ve observed a great deal of warbler behavior and habitat in my two short years of birding. And I’ve had some amazing mentors in these two years, I must admit and am so thankful for your guidance (you all know who you are and you are awesome). to compile the little spreadsheet below at the end of this post. Someday I hope to write a book at which point I’ll work on more detailed citations, but for today I had time to write a blog in hopes it will inspire a few people to dig deeper into this issue. Emails with corrections are always welcome and appreciated! Anyway, basically our beloved wood-warblers drop in during spring migration, disperse into appropriate habitat, breed, and then flock off in the fall migration. The NSBS hosted a presentation by Donna Crossland last Thursday evening where I learned there is not much left of less than 1% of our old growth Acadian Forest left (it was about 50% in pre-Colombian times, and 15% in the 1950s) and even the remaining younger, multi-aged (not clear-cut) Acadian forest is in grave danger. Most of Nova Scotia’s working forest is clear cut. We are on a 55-year cut cycle, far too short to maintain the Acadian forest which should be selectively harvested (not clear-cut), and trees such as red spruce, hemlock, and sugar maple allowed to grow to 150 years of age (or more). The Nova Scotia government promised to reduce clear-cutting, and has done no such thing. Aside from soil erosion leading to potential coastline erosion, and the release of carbon into the environment (remember plants remove carbon dioxide from the environment into the soil) imagine the horror for the birds and other animals who lose their homes, and inevitably perish. Basically, if we keep chopping down their homes they will have nowhere to breed. They are increasingly showing up to find their habitat and food had been destroyed which is a problem for both the present and the future. My focus here is on the wood-warblers but many other bird species require the very specific habitat of the Acadian Forest such at the Black-backed Woodpecker, and the Nothern Goshawk to name just two. Anyway, as I reflect on my last two years in birding I am reminded that you have to do a bit of work to find some of the most prized wood-warblers. Well it’s not work for me at all to walk in the woods, but it’s something not many people seem interested in doing these days somehow. All my favorite magical forests are old-growth forests and largely Acadian it would turn out, with Keji being one of my most treasured places to spend time. I’ve also greatly enjoyed walking in the Thomas Raddall provincial park, the Abraham Lake Nature Preserve, the Mount Uniacke Estate park, the Herbert River Trail, and the woods around my parents’ house just to name a few. 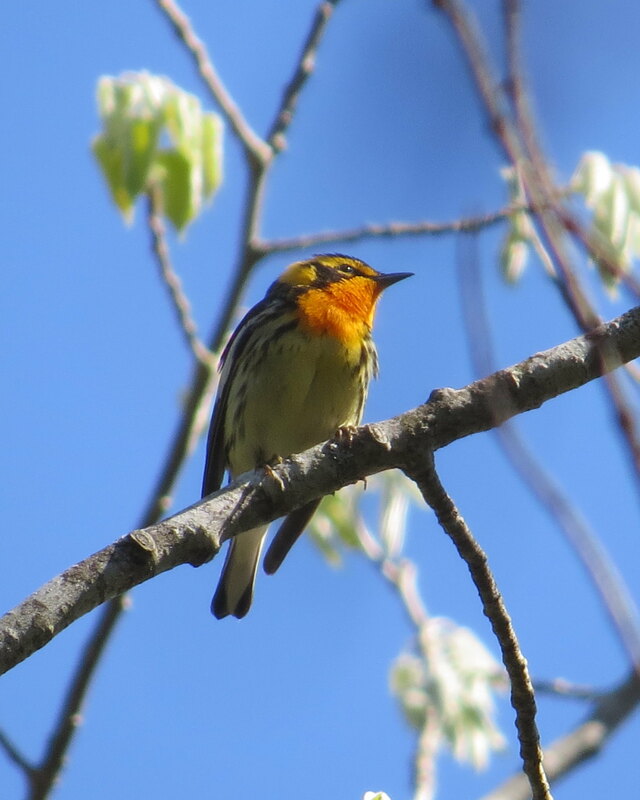 I remember looking up so high in the trees to spot the singing Blackburnian Warbler in Mount Uniacke Estates park and realizing this now scarce habitat explains why they are not always easy to find in Nova Scotia. It occurs to me now why many of the seasoned birders frequently comment there are “no birds anymore”. Migration season used to be a very different experience here in Nova Scotia apparently. And that is very sad isn’t it? Someone needs to do something and I agree with Donna Crossland who suggests the birders are the perfect people to spearhead the cause. Simply put, clear-cutting is short sighted and harmful to wildlife. We deserve a sustainable forestry industry in Nova Scotia that is guided by good science and education, and stewarded by forestry experts, not lumber executives. And now that I know we are sending all this biomass to China and Turkey I am steaming mad. We are chopping down all our forests for a cheap buck and sending it away in little wood chips. Nothing to be proud of, indeed. As a little aside, maybe we only hear of protecting the Boreal Forest because the Acadian Forest is pretty much already gone? I digress, but basically we have two types of wood-warblers that visit Nova Scotia. We have the “vagrants” who don’t belong here really, and certainly don’t breed here. They are the ones who have us scanning multi-flora behind funeral homes and other odd places during migrations or fall outs, and making the non-birders wonder what the heck we are doing. Then we have those 22 warblers who come to Nova Scotia specifically to make babies and fly off with them in the fall. They go in two waves, the parents and new birdies typically not together. It is a joy or nature everyone should witness so please consider getting involved and engaged with this issue. In my opinion land conservation and activism is one of the best places you can donate your money or your time in our province. I smile as a remember some of my favorite birding moments have involved fledgling birds, specifically warblers.